Description: The #200 Wheel Horse was the very first riding toy ever made by Fisher-Price! This one-year-only horse was soon replaced with 1935's #225 Wheel Horse - a much bigger and sturdier riding horse. Both the #200 and #225 Wheel Horses look similar, however the #225 is a bit larger. FPT4089 - White wooden riding horse with a black square patch over it's eyes, a tail made of real horse hair, a red leather bridle, and 4 round peg legs that are mounted onto a red platform that rolls on 4 wooden wheels. A small red wooden seat for a child rider is mounted on the horse's back. The horse does not have a Fisher-Price logo or model number written anywhere on it. Measures 14-1/2" tall. 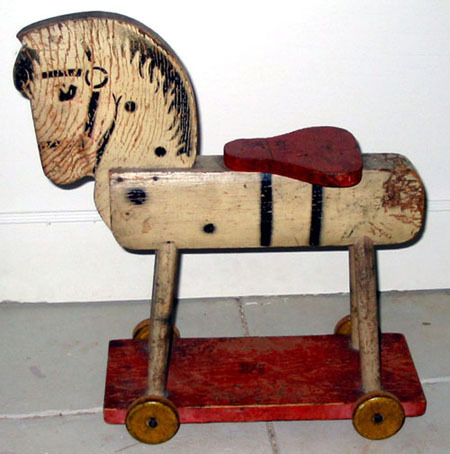 There were 5 different versions of a riding horse used during the early years of Fisher-Price, from 1934 to 1940's, click here for a list of these variations.